The other day I posted a question on Facebook – How old was your child when they started doing chores around the house? I received lots of amazing responses! Ages ranged from 2-5 doing different jobs, some for money, others just for the responsibility of pitching in to keep a clean home. This got my creative wheels turning. My oldest daughter, K, helps around the house, but she doesn’t have designated chores per se, and she should! 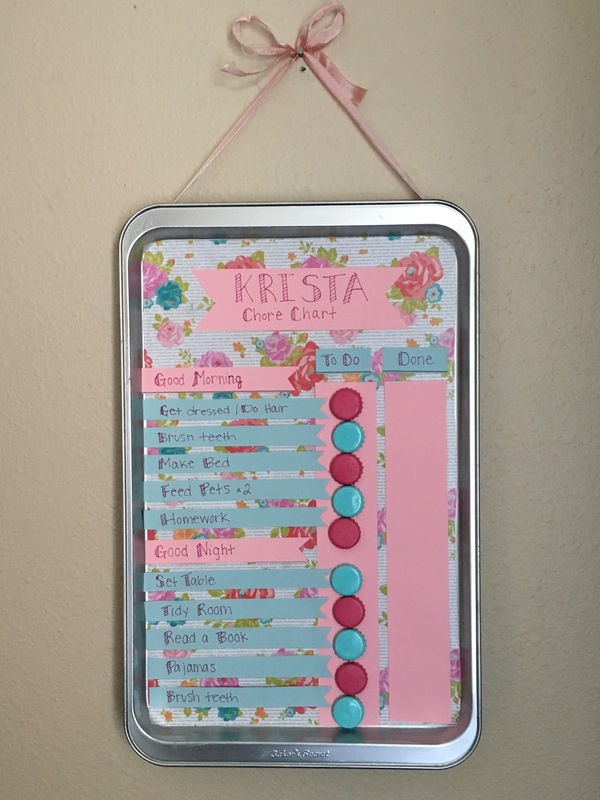 So to make it fun, and to add more of a visual instead of just telling her what needs to be done- I decided a chore chart was the way to go! 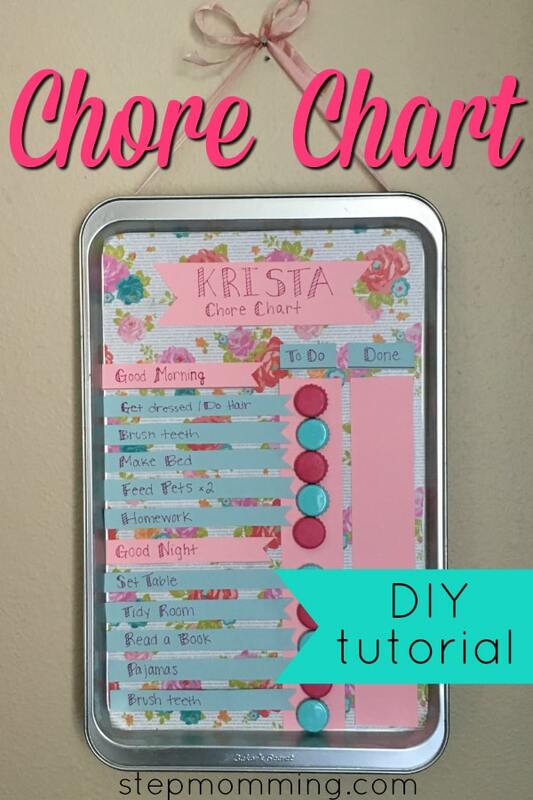 There are a lot of amazing DIY chore charts on Pinterest, of course, but I wanted mine to be unique and colorful. 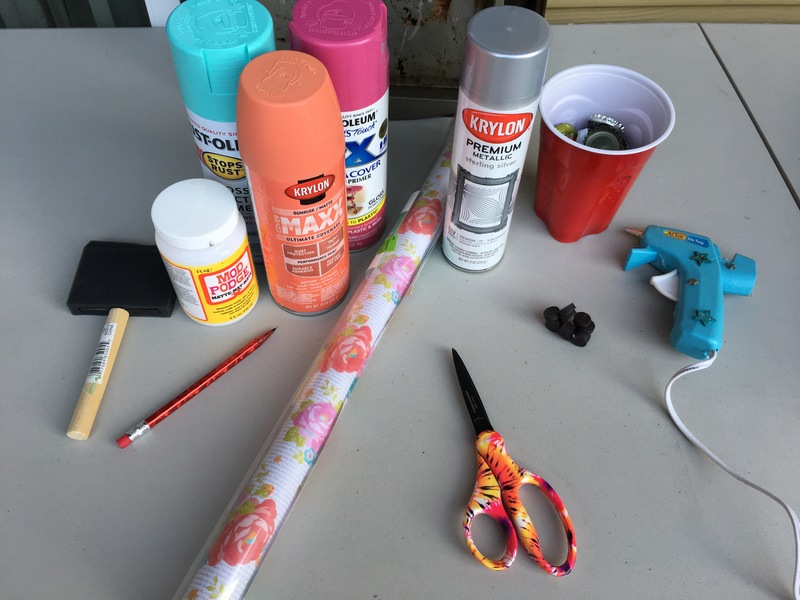 I also wanted to use whatever I had around the house without having to buy things, and I didn’t want to have to use power tools. Thinking about what to use, I went back and forth between a dry erase board, a wooden board, or a cookie sheet. 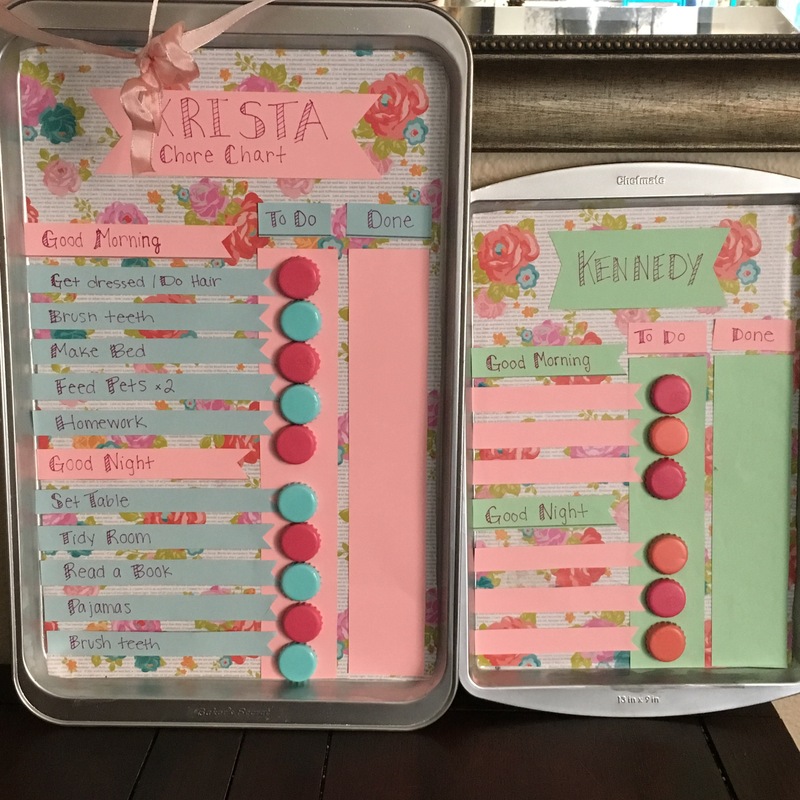 We had all the materials, but my dry erase board was too big, the wood was too small, and I didn’t think either would work as well for what I had in mind. So, I settled on the cookie sheet. Ever since James and I joined our houses, we’ve had a plethora of cookie sheets in our kitchen cabinets, lol. Some quality, some not so much. I figured, why not repurpose the old nasty ones?? 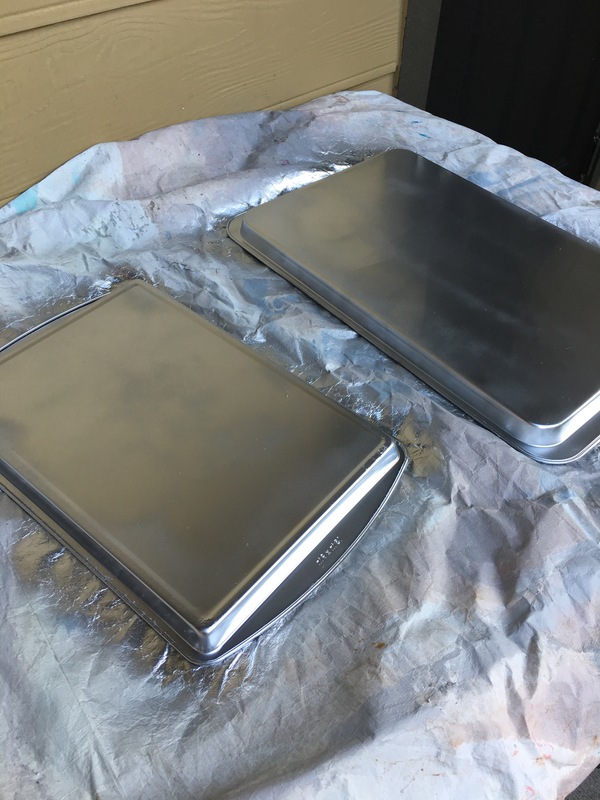 First, after laying down the tarp outside, you’ll want to spray paint the cooking sheets silver. Then spray paint the bottle caps whatever color you want. 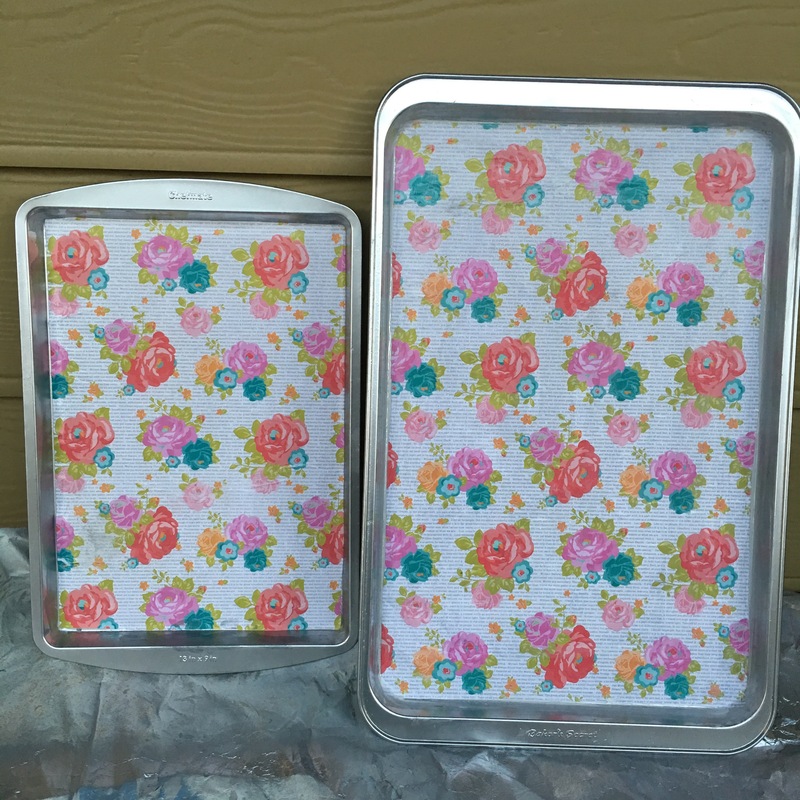 Next you’ll need to measure your wrapping/patterned paper to fit just right inside the baking sheet. I had one cookie sheet that was 9×13 and another that was 11×17. Measure yours, and cut it to size. Now you need your mod podge. 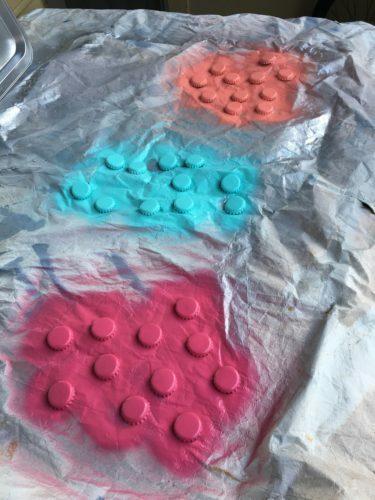 Spread a thin layer all over the inside of the cookie sheet. 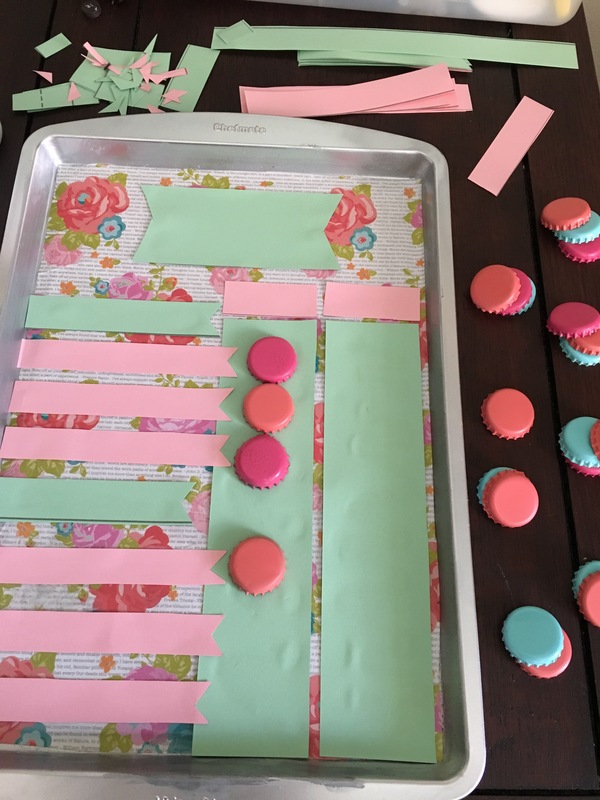 Take your patterned paper and line it up at one end, carefully laying/spreading it down so that there are no wrinkles or bubbles. I had to do a push/tug maneuver to work it right. You don’t want any bubbles otherwise it may peel up. Now add another, thicker layer of mod podge on top-especially around the edges. Aren’t they so much prettier already?? Now once you have everything cut out, you need to glue it on. HOWEVER, I caution against using Elmers glue. If it’s all you have, it’ll work, but it tends to make the paper either bubble up when there’s too much, or pull away if there’s not enough. I tried it on one chart and tape on the other. Double sided tape worked much better! I liked using the tape runner I use for scrap booking. Ok, now that everything’s pasted down, time to write everything on it! Name, To Do, Done, and all the chores. I also added “good morning” and “good night” banners to signify when certain things needed to be done. Next, we need our magnets. This is when you’ll need your hot glue gun. Take one bottle cap for every chore, put a dab of hot glue on the underside, and stick a circle magnet to it. I love turning bottle caps into magnets. It’s so easy! Hot glue doesn’t always stay in my experience (plastic spiders stored in a hot attic, cough cough) but it adds just enough support to keep the magnet from letting go of the metal. Last but not least, we need a way to hang this baby. If you remember, I didn’t want to use power tools for this, and you don’t need to! These cookie sheets have sided around them, and we’re going to use them. 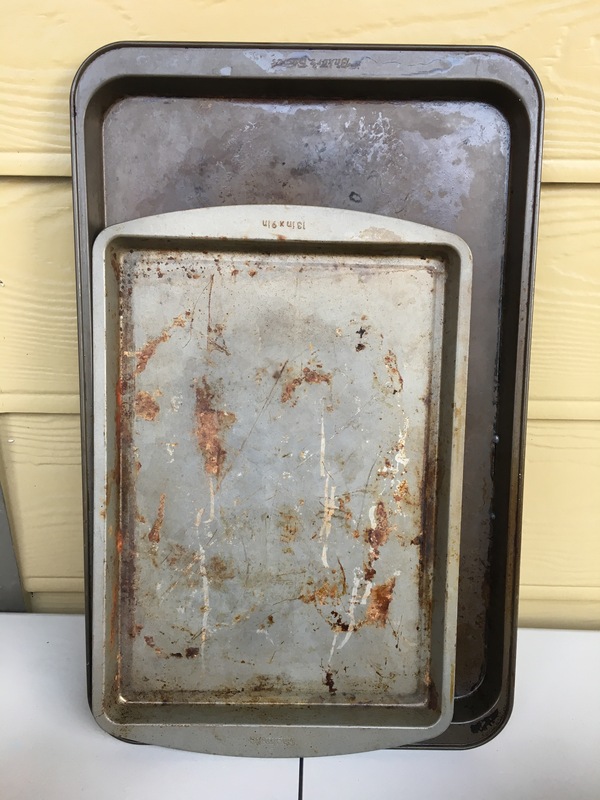 Flip you cookie sheet over so that the back is facing up. 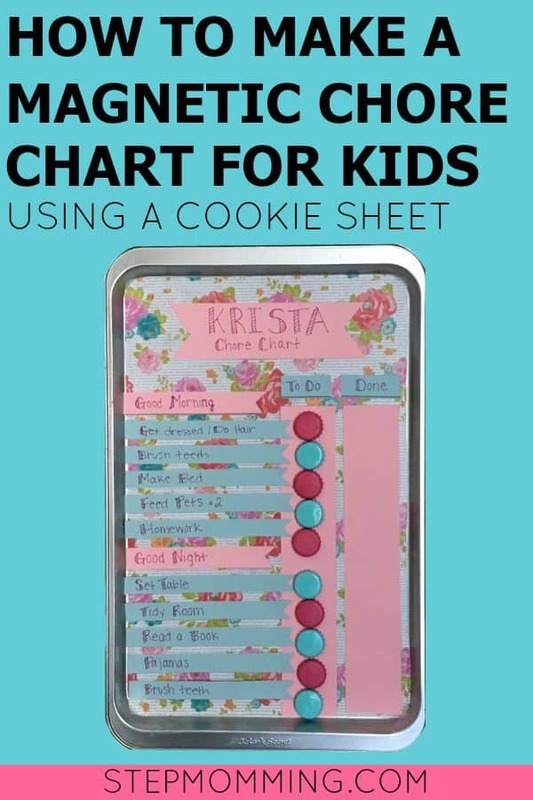 Take your ribbon and measure all the way around your cookie sheet, leaving enough extra up top to be tied above into a bow. 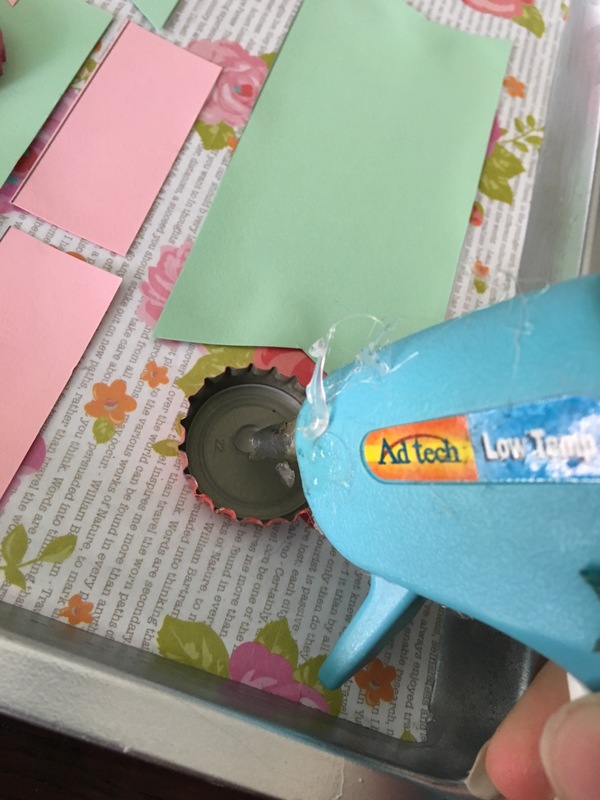 Use your hot glue again to glue around the edges of the baking sheet, attaching the ribbon all the way around, pulling taut as you go. You’ll want to glue the ribbon to the bottom and sides, but not the top. Once you’re done, tie the top portion into a bow. I just love the way these turned out. I even made the small one for when K2 gets older. It’ll probably be awhile before she can use it, lol. I’ll let you guys know how well it works for K. I’m hopeful it’ll keep her on track. We’re also playing with the idea of paying her each day she finishes everything on her chore chart. Not just as a way of saying good job, but in an effort to teach her how to save money. PS: Not sure what kind of chores are appropriate to have your little ones start? 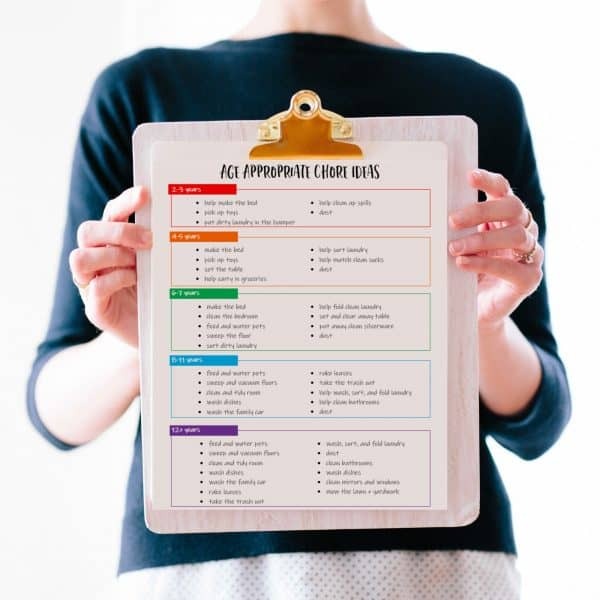 Subscribe to Get Your FREE Chore Ideas by Age Reference Guide! 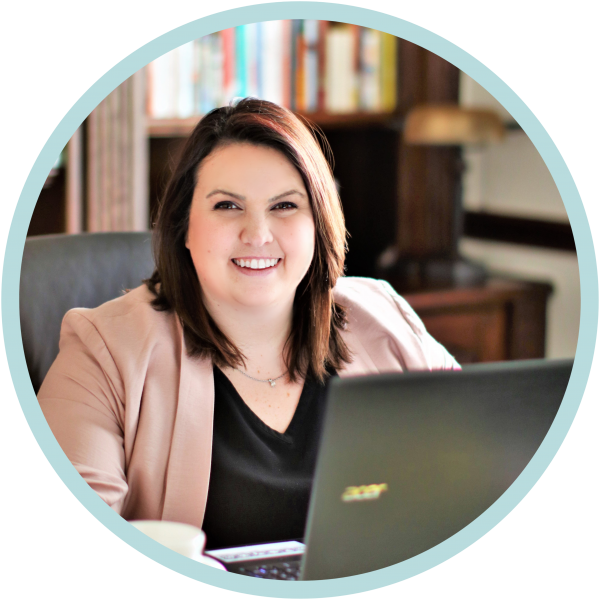 Exclusive for Stepmomming subscribers, FREE Chore Ideas by Age Reference Guide sent directly to your inbox! In fact, when you subscribe, you’ll get access to ALL of our freebies!